If you leave your Olive Garden table with even one breadstick in the basket, you have failed as a human being. The free side has always been the crown jewel of the Italian chain's repertoire, and it's now about to migrate over to the entree section in the form of two new sandwiches. 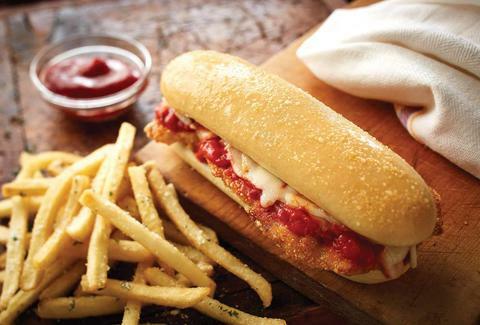 Beginning on June 1st, Olive Garden will offer chicken Parmigiana and meatball breadstick sandwiches at locations nationwide. OG rep Justin Sikora says the breadsticks for these items will be a bit shorter and wider than the ones you know and love -- but both sandwiches will also come with the standard side of unlimited breadsticks, so consider your bases covered. The meatball sub will go for $6.99 while the chicken Parm will cost $7.99. Seeing as these guys are strictly lunch menu-only, make sure you set aside time afterwards for a carbs crash nap. Kristin Hunt is a Food/Drink staff writer for Thrillist, and really wants a meatball sub now. Follow her to Italian sandwiches at @kristin_hunt.